September is right around the corner and I'm looking forward to 2 exciting opportunities coming up. First, I'll be heading off with 10 students to teach a painting workshop in Lake Garda in Northern Italy. I've been to that location to teach several times before and I can't wait to revisit some of the beautiful scenes and the enchanting lake and share them with these new participants. I am also going to spend a couple of days beforehand on my own on Lake Como. The painting above is the view of a villa from right near where I'll be staying- it is idyllic. 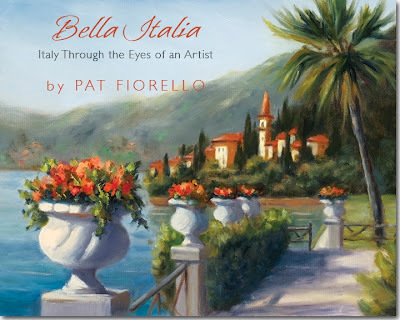 I am also anticipating seeing my book, "Bella Italia, Italy Through the Eyes of an Artist" completed. Yesterday was an exciting day. I went to review color proofs on the press at the printers in Tennessee. It was fun to see what I've been working on for so long getting so close to becoming real. 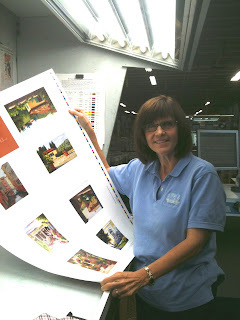 The staff was great and gave me a tour of the entire plant so saw the whole operation from where the paper comes in to the set-up, printing, cutting, collating, sewing, glueing, covers added, packed to ship. 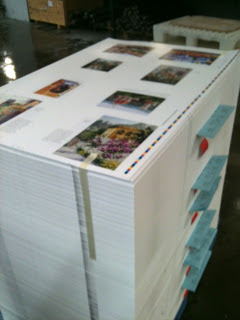 Here are some photo's to give you a peek behind the scenes. These are rolls of paper that come in via rail for each week's production. The manager, Terry, standing next to a roll of paper so you can get an idea of how large they are. The book pages automatically get hole punched and sewn together. See the spools of thread near the top. By the end of the day, all pages were printed , ready to go on to the next stage in the process. You may have noticed my blog postings have been a little less regular than usual this summer. Lots going on with family, travel, painting commissions etc.. so a bit out of my regular rhythm, but also been busy writing and developing a new book pictured above: "Bella Italia, Italy Through an Artists Eyes". In the book I share what makes Italy beautiful from an artist's perspective and through over 80 of my oil and watercolor paintings of Italy inspired by my many trips there. This hardcover, 120 page book is $35 plus $5 shipping. It is currently being printed and will be available in October, however if you'd like to be one of the first to receive a signed copy from me, you can pre-order now with the "buy now" button above or on my website at: Order Book Here. Hope you will join me on a visual tour of beautiful Italy with this book!